Show report by Matt S.
This was my first PAX Australia. It’s not that I deliberately ignore the event, but after going to the Tokyo Game Show each year, it’s difficult to justify further travel expenses in order to attend smaller scale events. But I’ll be going back to PAX each year going forward, because as it turns out, it’s much different to the small-scale TGS that I had assumed it would be. PAX Australia is quite impressive. Well, aside from the ugly-as-sin tank out the front. 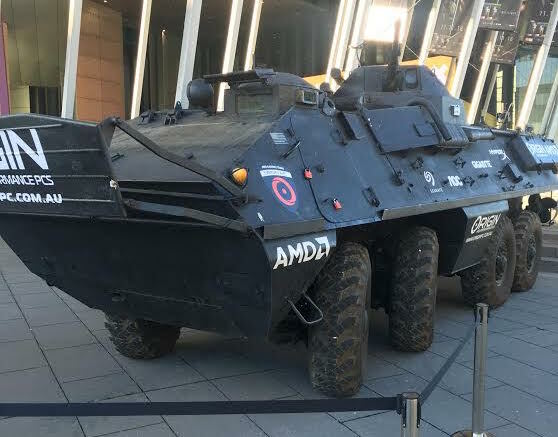 Before you even got in the convention centre there was a full-sized tank, advertising a bunch of PC-focused gaming companies. This was galling at first; the event that proudly refuses to allow “booth babes” and short skirts on the show floor has no problem indulging in the similarly-offensive exploitation of the military and warfare. In the context of a show like TGS (where there are also tanks) it’s one thing, but yet another reminder of the hypocrisy of the West when it comes to content standards was not the way I wanted to start my PAX experience. Thankfully, once I was actually in the halls, the military iconography was far less prevalent and I was able to enjoy the show for what it was. What immediately grabbed my attention was just how much space was given over to independent developers (and, in most cases, indies from Australia). Dozens of local indies were showing off their games in an impressive display of what our game developers are able to do with small teams and creative ideas. From the medium-sized titles like Hand of Fate 2 (which, as an aside, looks and plays unbelievably well), to the college kids having the gumption to create a Smash Bros-like game for PC (and doing a good job of it, to boot! ), there was such a spirit of creativity and community in this section that, perhaps for the first time, I felt that the indies were the real focus of the show. The big developers and publishers were there too, from Sony, to Microsoft, Ubisoft and Square Enix, but the games on display there were already quite familiar and I didn’t feel any great compulsion to try these out. Sony had its PlayStation Pro displaying 4K improvements to Infamous, a game I didn’t care much about in the first place. I don’t even have a 4K display, so the Pro is hardly the selling point that VR was. In another hall there was a massive board and card game section, and this thing was really great. I honestly had no idea that the tabletop games community in Australia was so robust, but with row after row of vendors selling stuff to large crowds, I stand corrected. Found some nice prizes there, too; there’s a Final Fantasy TCG that has just been released, and I just had to try that. I’ll let you all know how the game plays, but the card art, if nothing else, is beautiful. The other big side to PAX is the endless panels and presentations, which of course was my main “excuse” to be there, as I was on a panel myself. One of the smartest things that PAX has done is to source its panels publicly. Anyone can submit a panel idea, and as long as the panellists are interesting and expert enough, and the topic is worthwhile, chances are the panel will get approved. It’s smart because, firstly, it results in a huge variety of different topics being discussed and gets a wide range of people in front of the broader gaming community. The other benefit (from PAX’s perspective) is that it means they don’t need to pay anything to have these events on. My panel was on the topic of TGS and Japanese games. We discussed the Nintendo Switch, cultural differences, and our highlights from the show, and of course those are all my favourite topics. It’s a pity it wasn’t one of the streamed panels, as I’d love to have been able to have the whole DDNet readership following along; the debate was robust and friendly, and the community questions that we got to answer were insightful too. I’m not sure why PAX doesn’t stream all panels by default. It really should. The Melbourne Convention Centre is large, and there was plenty of room to move around; PAX Australia felt alive without ever being uncomfortably crowded. While it wasn’t as big as TGS (of course), the organisers have done a brilliant job in fostering a community spirit at the event, and in terms of support for the Australian games industry nothing comes close. I was only there for one day this year. Next year I’ll stay for the whole event.